BAKERLOO, feat. Dave ‘Clem’ Clempson: Bakerloo (LP, Harvest, 1969, A-side). TEA and SYMPHONY, feat. 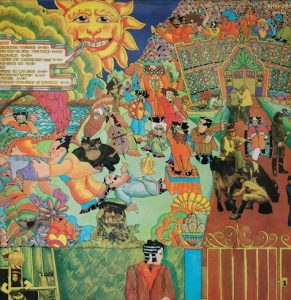 Dave ‘Clem’ Clempson: An Asylum For The Musically Insane ( Harvest, 1969, A-side). BAKERLOO: Bakerloo (LP, Harvest, 1969, B-side). TEA and SYMPHONY, An Asylum For The Musically Insane (Harvest, 1969, B-side). COLOSSEUM, feat. Dave ‘Clem’ Clempson: Valentine Suite, LP, 1969, A-side. HOMAGE TO CATALUNYA: LLAMP TE FRIGUI: Angelets (cd LLTF) http://llamptefrigui.fr/. RADIO 68 PLAYS Tony Joe White’s first album (Black and White, 1969) + originals + covers AND related artists: Jimmy Webb, Joe South and Creedence Clearwater Revival. TONY JOE WHITE Black & White, LP, 1969, entire A-side. Covers & Originals: Elvis, Dusty Springfield, Otis Redding. TONY JOE WHITE Black & White, LP, 1969, entire B-side. Covers & Originals Slim Harpo, Roger Miller (LP ‘A Tender Look At Love, 1966), The Troggs (LP ‘Cellophane’), Dusty Springfield, The Yardbirds, Jimmy Webb (LP ‘Words and Music’), Glen Campbell. Dave ‘Clem’ Clempson played a role in all three groups. Bakerloo were originally formed as the Bakerloo Blues Line in 1967, at the outset of the blues boom spearheaded by Cream. A power trio similar to the latter outfit, they also incorporated some of the artier elements of pop music from that period — Dave “Clem” Clempson played solid, bluesy lead guitar, but he also doubled on harpsichord and piano as well as providing the mouth harp, while Terry Poole played bass and Keith Baker played drums. They released a heavy album in 1969. Clempson left to join Colosseum in 1969, the year of their album ‘Valentine Suite’ . He also helped out Tea & Symphony on their album ‘An Asylum For The Musically Insane’ (1969). Gus Dudgeon produced Bakerloo’s and Tea and Symphoy’s albums, which were both released on Harvest. RADIO 68 PLAYS Tony Joe White’s first album (Black and White, 1969) + originals (Roger Miller, Otis Redding,)+ covers (Elvis, Dusty Springfield, Glen Campbell, The Troggs). PLUS related artists: Jimmy Webb, Joe South and Creedence Clearwater Revival.